That spice mix will impart a nice Mexican flavor to your dish, but we highly recommend our chicken recipe! Fine… I’ll stop talking about our chicken now! The Cheese..or Should I Say Queso! As with most recipes you can use any cheese you want. We’re using Queso Fresco though. The benefits of using Queso Fresco is that it doesn’t melt as quickly as most cheeses. You can get a nice crisp on it without it fully melting. Those attributes make it a good fit for this dish, although a simple cheddar cheese would work great as well. Queso Fresco can be found at most grocery stores down the ethnic isle. Bake for 20 minutes at 350. You might want to go a bit longer, this will depend a lot on the ripeness of your avocado. 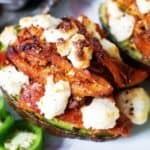 If you have a perfectly ripe avocado you could even opt for popping it under the broiler for 5 minutes and completely omitting the baking process. This will produce a less cooked through avocado(which some people will find more desirable) with a hot and melty topping. This dish works best with avocados that are at, or slightly passed their ideal ripeness. If you use an avocado that hasn’t yet become fully ripe the final product will not be nearly as tasty. Cut a ripe avocado in half and remove seed. Pack as much shredded chicken into each half as possible. Top with crumbled Queso Fresco. Bake for 20 minutes. Enjoy!